Choosing a name for your podcast is a hugely important part of the planning and launching stage. You can have the best content and audio quality in the world, but a poorly named podcast can prevent most of your target audience from ever hearing it. So what makes for a “good” podcast name? What factors should you take into consideration? 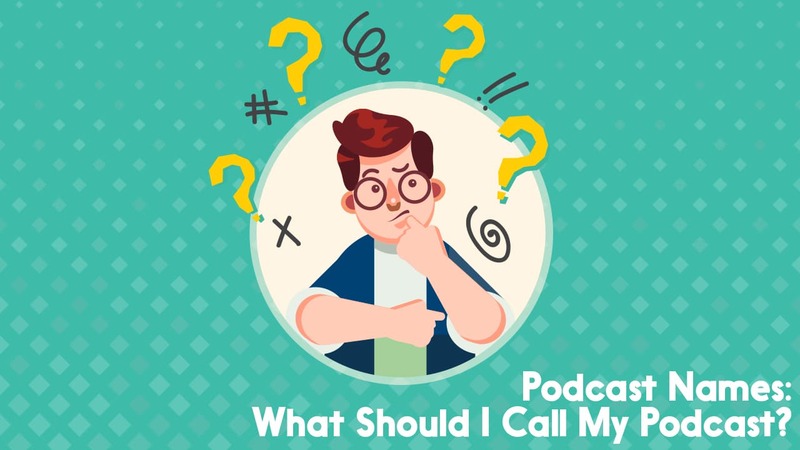 And what are some of the common mistakes made by podcasters when it comes to naming their shows? These are the things we’re going to take a look at in this one-stop-shop guide to podcast names . . .
Before choosing a name, just make sure there aren’t any other shows already using it. A quick search in your podcast app will let you know what’s available and what isn’t. You might find a show using the name you had your heart set on, and spot that they stopped putting episodes out back in 2007. As frustrating as this can be, don’t just bash on and decide to use it anyway. At the very least, it’ll cause confusion for your listeners and potentially harm your audience growth. Even using a very similar name to a pre-existing podcast can be a bad call, regardless of whether that show’s still active or not. It might be possible to get in touch with whoever ran this show though and see if they’ll actually give it to you, or let you buy it off them. If you’re absolutely desperate to use a certain podcast name, then there’s no harm in asking. Here are the 3 main schools of thought when it comes to naming a podcast. Creative or “clever” names are often built around a play on words, or an esoteric term from the show’s topic or niche. Many of these names make sense when you look deeply enough into them. But others are just plain abstract, and offer no hint into the show’s actual content. If you already have an audience, a reputation as a good content creator, or a big marketing budget, then this won’t necessarily hold you back. If enough people check out your show and enjoy it, then you’ll do fine. But if you’re starting completely for scratch then you need to ask yourself what your target audience are searching for online – and if your podcast name is going to show up in these searches. If you’re at this stage, then the next option is the best one for you. This type of name can be described as “doing exactly what it says on the tin”. You might think of this as the “boring” option, but as long as your content isn’t boring, nobody’s going to care. Descriptive podcast names are immediately identifiable to their target audience. And they’re easier to find because they perform better in searches. However, if you have a really creative or clever name picked out for your show and are desperate to use it, you can always find a way to merge it with a descriptive title, too. Be careful with overly long podcast names or “keyword stuffing” though, as iTunes/Apple Podcasts have really started to clamp down on this. But using commas and ‘separators’ in your podcast name might now see you rejected by Apple Podcasts when you try to submit there. This is the unfortunate result of a minority of podcasters filling their podcast name fields with keywords in an attempt to rank for every search term under the sun. So be a succinct as possible with your podcast name to avoid any issues here. If you can’t get into iTunes/Apple Podcasts, you’re going to have serious issues growing any sort of audience. Podcasts that are named after their hosts generally have one thing in common – the host already had an audience before they started the podcast. These names offer no hints about the shows content. If you’ve never heard of Tim Ferris, his show could be about literally anything. As it happens, the podcast is about “interviewing world class performers” in all fields, linking together the similarities and routines that connect them. If nobody knew Tim Ferris, he’d probably have put a bit more description into his title. Something like “How to be World Class” would certainly catch the eye of his target audience. If you’re podcasting as part of your business, and that’s built around your name (or company name), then until recently you could’ve added that in there alongside your show title. For example – “Training for a Marathon, with Jane Smith”. But that type of name would likely now be rejected by iTunes/Apple Podcasts. In order to have it accepted, Jane would likely need to shorten the show title to “Training for a Marathon”. As you also need to fill out a provider or “author” tag when creating your show inside your media host, you can still rank for searches for your own name or your business name by adding it there instead. You can see an example of this in the screenshot here, taken from inside the Apple Podcasts app. 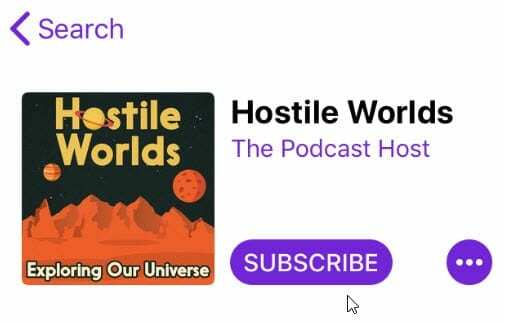 Here, our podcast name is “Hostile Worlds“, and the creator/author/provider name is “The Podcast Host”. So they’re both very much still in there, just not all in the show title itself. There’s no harm in putting the word “podcast” in your show title. But it can be a little redundant. When someone is searching a podcast directory for new content, every result they get is a podcast. Of course, a name like “The [your topic] Podcast” can still work really well. But if your name is a bit longer, and you’re looking to save space, then the word “podcast” can be the first to go. You’d maybe still want to mention the word “podcast” on your actual website name to cater for Google searches, but you can often leave it out of your podcast name when entering that detail into your media host. When a listener searches for a term or keyword in a podcast directory, they’ll be presented with a “ranked” number of options. Most podcast directories (including iTunes/Apple Podcasts, which is comfortably bigger than all the rest combined) won’t search through your shownotes, subtitles, etc. They’re only looking at your podcast name, provider name, and episode titles, so you’ll need to work your keywords and SEO-friendly terms into these. Again – just be sure to do it in as succinct and as “non-spammy” a manner as possible! And though having clearly and descriptively named content is a best practice, it doesn’t mean you’ll automatically jump to the top of any search results. There’ll be other shows competing for these terms too. And if they’ve been around longer than you, they’ll likely rank higher because they have a greater number of all-time subscribers. Some topics are ultra-competitive too, because there’s so many podcasts on that subject. It’s extremely hard to rank for things like “money” and “business,” but if your show is about painting garden gnomes or pigeon roller skating then you’ve much more chance of being found up at the top. Don’t be too disheartened if your topic is really competitive though. Just keep putting out consistent and great content, and keep encouraging listeners to share and subscribe to the show. Put your time and effort into the things you can actually control, as opposed to fretting over how other podcasts are doing. And search isn’t the only way to be found either. In fact, we have a course on podcast audience growth inside The Podcast Host Academy which gives you loads of other tips and techniques to employ on the promotion and visibility front. If you have a handful of potential podcast names picked out, you can say to someone “I’m doing a podcast called ____. What do you think it’ll be about?”. This helps if the person isn’t in your target audience, or doesn’t know that you have that weird pigeon roller skating hobby. Any “inside info” might give them a clue that folks searching online won’t have. There’s no one single answer here about what approach you should take. It depends on you, your topic, and the type of podcast you’d like to make. It is likely that you fall into the camp of “I have no audience right now, and I’d like to grow one” though. If that’s the case, choose as descriptive a name as you possibly can. Give yourself the best possible chance of being found. And remember, your podcast name isn’t set in stone. You can tweak or change it at any time. That isn’t to say you shouldn’t try to choose a good one right from the beginning, but don’t get so stuck on this that you never actually launch the thing! The first is The Podcast Host Academy. This is our membership site where you get access to all of our tutorials, downloadable guides, checklists, and ebooks. In there you’ll find courses on everything from editing to interviewing, as well as our podcast promotion course (mentioned above), and our regular live Q&A sessions. The second option is our Podcast Launch Package where you can work directly with us one a one-to-one basis. Here we’ll spend 4 one hour sessions coaching you through the entire process of designing, planning, and launching your podcast. On top of that we’ll produce your first 4 episodes for you too! If you’re all good to go though, then I hope this guide to podcast names has been useful to you. Best of luck with your show. And if it’s about pigeon roller skating, then please do let me know what you called it . . .
Blogging Vs Podcasting: Which Content Marketing Method? Thank you so much I am doing a project for school and I came up with the name 101% Games as a game critic podcast. Hope the project goes well, Carter!